← Johan Huyck beats Geert VdS in high-level Winter Series 6-4. Maurits and Zsolt wrap up Autumn Series. On 30 October 2015, in an office building in Brussels, Maurits and Zsolt played the first of a series of ten 9-point matches. They did so during the lunch break at their job, in a cramped room where cleaning products, plastic buckets and dust brooms are stored. Hardly a worthy sporting arena, but adequate enough to play backgammon. In their eagerness to learn and improve, they recorded and transcribed the match and kept this up till they finished their Master Series (10 x 9) early February 2016. Had they played for money, Zsolt would have made a nice profit, comfortably winning the Series 7-3. In this quasi academic format, however, where no pecuniary gain can be expected, players need not worry about the caprice of Lady Fortune, but instead can invest all their attention and mental energy in finding the optimal play. Autumn Series. Overall PR Maurits Pino. Autumn Series. Overall PR Zsolt Tasnadi. Both played at Advanced level. This, undeniably, is an achievement. It takes hundreds of hours of study and practice to achieve this. One can imagine though that they will both be slightly disappointed by these data. I imagine they would have secretly hoped for PRs in the range of 6,50-8,00. The playing conditions can certainly count as extenuating factor. It is hard to focus on the game if you have just stepped away from your desk and know that you will be heading back to your paperwork once the match is finished. Still, I would evaluate this performance as below par for players of their level. As always, the performance gap lies in the cube actions. Maurits did astonishingly well in this respect. A PR below 10 is almost unmatched in Belgium. It would be too rash to conclude that we have a cube magus in our midst, but the feat is definitely praiseworthy. Zsolt, on the other hand, seems to have suffered significantly from the strained playing conditions. I am in no position to speculate further on the cause of this débâcle, but I will certainly be excused for stating that Zsolt under-achieved here. The positive side-effect is that any improvement in that area will boost Zsolt’s overall PR enormously. His checker-play is close to Expert-level, so any normal cube performance should lift Zsolt’s game to the 6,50-8,00 Performance level. 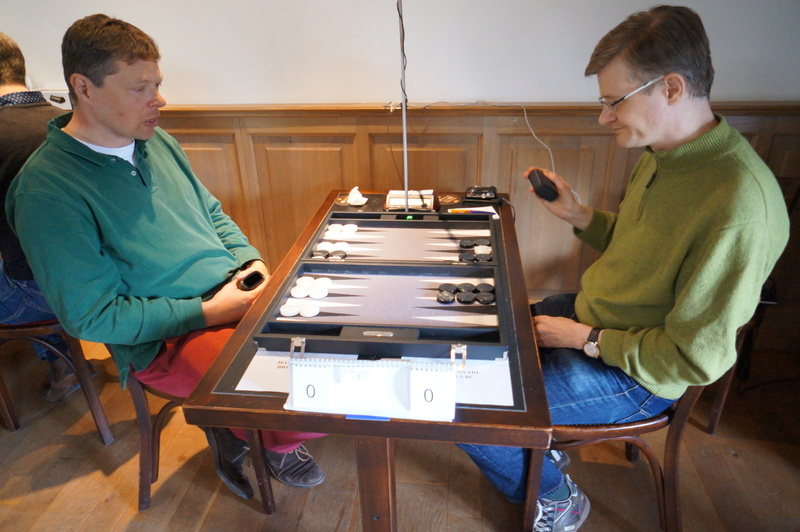 Maurits (left) and Zsolt (right) on the 1st Brugge Backgammon Day. By playing this Master Series, Maurits and Zsolt have gained a spot on the BMS Grading Table. Kudos to both players! You can find the BMS GT by clicking on BMS(BE) in the black banner above and scrolling down to Backgammon Master Series.